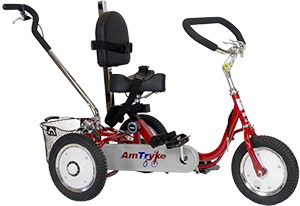 ProSeries 1412 Foot Tryke - 12 inch front and rear wheels. Now comes standard with Rear Steering and safety flag. 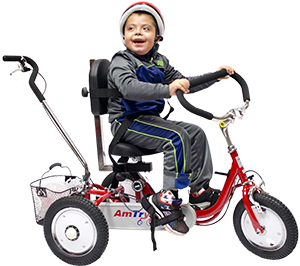 The ProSeries 1412 has a fixed drive that helps children who might otherwise have problems making a full pedal rotation. The foot crank is constantly in motion for full therapeutic effect. Coasting is not possible with a fixed drive; when limb motion stops, the bike does as well. ProSeries 1412 can be adapted with a wide variety of seating options and accessories—helping rider feel safe and secure. Available in Amtryke red. Assembly required. 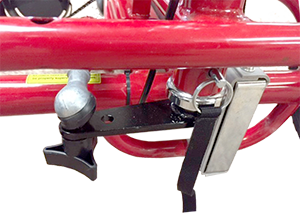 NEW: Now comes standard with Rear Steering, Medium Pommel Saddle Seat and a safety flag.